A premature baby whose heart stopped beating for 22 minutes has been called a “miracle” by doctors who treated her, as she celebrates her first birthday. Lacey Sherriff, who was born at 27 weeks weighing 1.4lb (635g), had two cardiac arrests during emergency surgery when she was five days old. Her parents prepared for the worst – but their daughter survived. Doctors at St George’s Hospital, in London, say Lacey should develop and live a normal life. 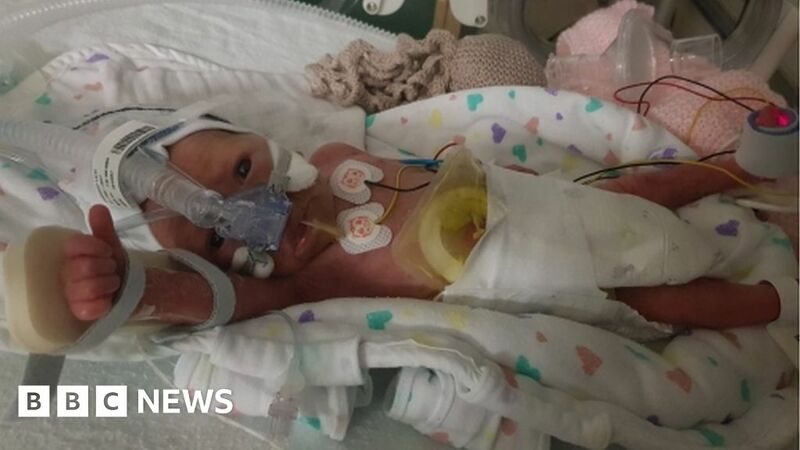 Lacey was born via emergency Caesarean section at St Peter’s Hospital before being transferred to St George’s five days later for urgent surgery to treat a severe bowel condition called necrotising enterocolitis (NEC). During the operation, her heart stopped beating for 12 minutes before doctors managed to stabilise her. And then her heart stopped again – for another 10 minutes. He said he had never seen a case of a baby so young and so sick, who had essentially ‘died’, recovering with no signs of brain damage. Dr Breen said Lacey was “clearly a fighter” who had defied the odds to pull through. Lacey’s parents, Louise, 39, and Philip, 41, who live in Ashford, Kent, knew she was very unwell and her chances were slim. “We didn’t think she’d survive surgery and thought we’d be registering Lacey’s birth and death certificates at the same time,” Louise said. Undergoing major surgery at such a young age carries major risks but without it, doctors say, Lacey had little chance of survival. After the surgery, her condition improved slowly each day but she needed further surgery at 13 days old to sort out problems with her stoma, which was fitted during the first operation. Lacey was finally discharged after 111 days in hospital, in February 2018. Mr Zahid Mukhtar, paediatric surgeon at the hospital, said: “She’ll continue to have follow-up appointments but she should develop and live a normal life, which is excellent news. Lacey underwent surgery to reverse the stoma last month, which was successful, allowing her to use her bowel normally. The family are now back at home in Ashford with Lacey and their five-year-old son, Alfie. Louise said the four months Lacey had been in hospital had been very difficult, involving a three-hour round trip to see her from home – but she had known she had been in safe hands. “My daughter wouldn’t be celebrating her first birthday if it wasn’t for the staff at St George’s.